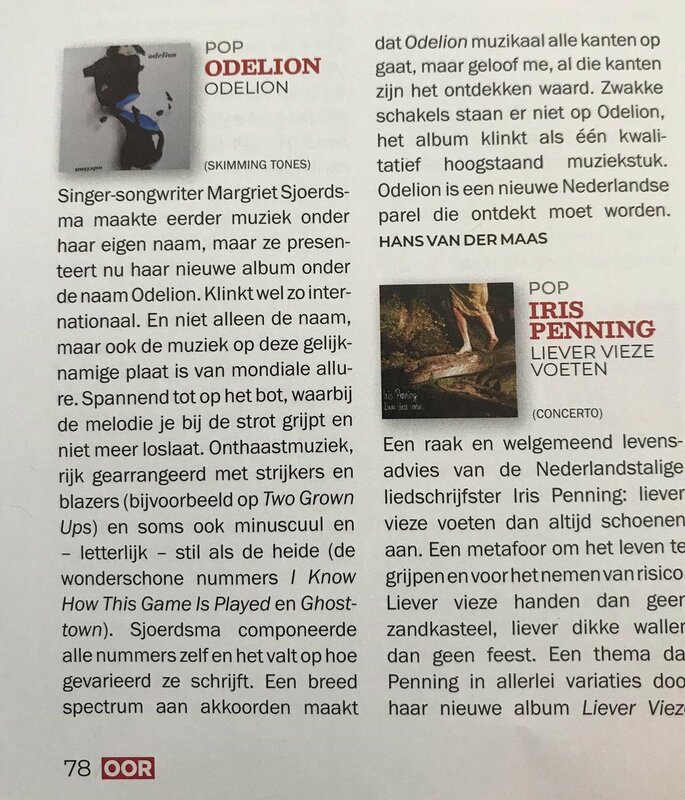 17-04-19: EERSTE FANTASTISCHE RECENSIE VAN OOR! About 3 months in Norway,the benefits of solitude and silence! It made it to Spotify’s New Alternative Playlist, Apple’s Acoustic Chill & Best of the Week! After taking care of a loved one a little too long and intense, ODELION wrote Blue Eyed Boy. My 2nd single Lying Hearts That Lie Awake At Night! I am so happy with this one. This is a song about feeling lonesome with the ones you love the most. Not daring to tell the truth. Trying not to hurt each other. As she writes in this song: 'We dance on eggshells, tiptoe gingerly, creating the illusion we’re a tight family. But we’re lonesome in each other’s company. But the lesson here turns out to be: 'It’s not always kind to be gentle and soft’. This is one of the finest songs I have written. It is about Forgivess. Forgiving others and myself has brought me tremendous joy these laste years. It is something I deliberately practise during meditation and improved the quality of my life significantly. It will be released in april! ODELION, an Amsterdam based singer and songmaker, can feel lonesome and lost in the middle of a crowd, but completely at peace on her own. To hear her own voice and heartbeat, she likes to escape citylife from time to time. Especially after periods of struggle and grief. ODELION’s debutalbum came to life in beautiful Norway. Inpired by the deafening silence of the Nordic landscape she wrote 12 intimate songs during a 3 month solo stay. In a tiny wooden house, far, far away from the hectics of daily life. With the comfort of not having to go anywhere but inside. Alone. Norway was the ideal scenery to write about never ending themes like letting go, daring to jump, loneliness, love and bewilderment. A time for reflection, of meditation and most and foremost: forgiveness. This is an album about heartbreak. And not just in the romantic sense. It’s about breaking our own very heart. And doing it over and over again. Until we become so fed up with pointing the finger that we are forced to take another route. Michelle Courtens playing cello makes your heart break. It's even better when she sings with it. I love singing with her. My first single Blue Eyed Boy! CONTACT me? I’d love to hear from you!